There are some incredible beaches in Puerto Rico that you must visit while you are exploring this fantastic part of the Caribbean. Puerto Rico beaches offer something for everyone from a Miami south beach style at Condado to the secluded tropical setting of Playa Sucia on Cabo Rojo to the relaxing Ocean Park Beach. If you are searching for a Puerto Rico beach that has flavor then Crashboat Beach is ideal with local vendors grilling island treats right on the beach as the sunsets. Puerto Rico also boasts several beaches on nearby islands like Vieques where you will find white sands at Caracas Beach as well as La Chiva Beach and the island of Culebra has superb snorkeling at Playa de Tamarindo. Whether you are looking for a beach to relax and sun or a day of exploring the beautiful underwater world, Puerto Rico has just the right beach for you and your family. Located about 20 miles off the mainland of Puerto Rico is the small Isla de Culebra. This tiny island is only accessible over the water. Set off on a boat or luxury catamaran for a day trip to see the selection of stunning Puerto Rico beaches on this little piece of paradise. Playa Flamenco is a magnificent scenic beach in the shape of a wide sheltered cove, offering soft pinky-white sand, with crystal clear aqua water on one side and lush tropical vegetation on the other. The beach is well maintained and has all the facilities you need including showers, bathrooms and high quality refreshment kiosks. Beach chairs and umbrellas are available to rent. The calm waters are filled with fish and make a perfect setting for snorkelers to explore. If you enjoy a touch of history, stroll up to the northern edge of the beach where you will see two ancient rusty military tanks. Then relax and soak up the sun while enjoying a local seafood ceviche followed by an exotic fruit smoothie. A beach located next to a National Forest makes a perfect setting for a day outing. 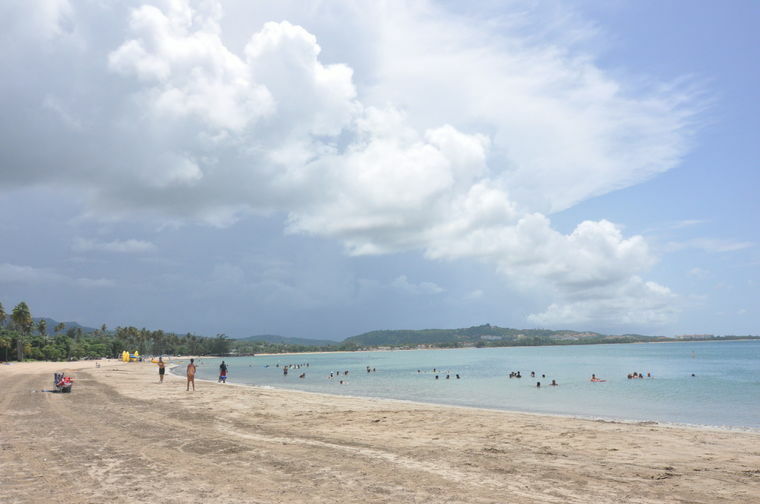 Luquillo Beach, also known as Balneario Monserrate is found on the far north west coast of the mainland and is one of the best Puerto Rico beaches. It is blessed with fine powdery yellow sand and framed with swaying palm trees that offer shade from the hot sun. 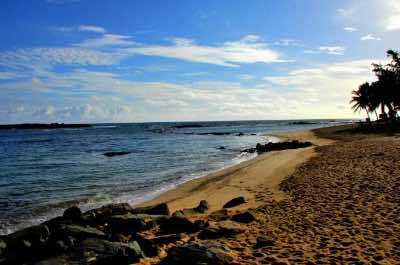 The crescent shaped beach is an idyllic setting for relaxing, walking, taking photos and swimming. A fringe reef protects the beach from big breakers, creating an area of calm and tranquil waters, ideal for families with children. A host of food kiosks offering delicious BBQ local treats are run by local vendors and offer some of the best beach side eating on the Island. When you have had enough sea and sand, set off to explore the beautiful El Yunque National Forest where you can hike and swim in natural pools under plunging waterfalls. 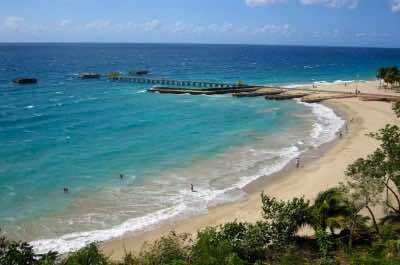 Puerto Rico offers some of the best beaches on the planet and the first Puerto Rico beach to explore is Pine Grove Beach. Located in the capital city, San Juan, it lies on the northern coast on the Atlantic Ocean. The beach is easily accessible, stretching from the Marriott Courtyard resorts in a crescent shape to the Ritz-Carlton. For ocean lovers, this idyllic beach surrounded by swaying palm trees offers the best of both worlds. The western end is sheltered by a large, off-shore reef that keeps the big waves out, creating a calm area that is ideal for swimming and snorkeling. The east end is more exposed and the breakers roll in, making it perfect for surfers and stand-up paddle-boarders. If you prefer to remain dry, relax on the clean, white sands and soak up the sun. Pine Grove Beach is famous for Yoga classes that take place every morning and evening. Grab a mat and join in, you will enjoy an exercise session that also calms the mind. The perfect way to start or end the day. 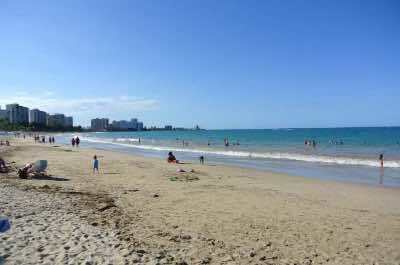 Isla Verde Beach is the next Puerto Rico beach that must be visited. It lies to the east of the capital city, San Juan on the northern coast. The name means 'Green Island' and the huge expanse of beach is actually made up of three beaches, Pine Grove Beach, El Alambique and Balneario de Carolina, covering a distance of almost three miles. The beach is very popular with tourists and locals, offering ample parking, shower areas, easy access to restaurants and hotels. 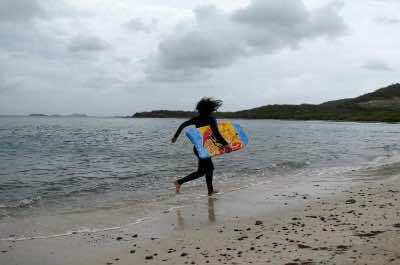 The beach has small waves, making it great for those who want to try their luck at surfing. For something different, climb aboard a banana boat or water sled. This water craft is flat and shaped like a banana and accommodates up to ten riders. Attached to the back of a speed boat, you will be pulled along for an exhilarating ride! Then explore the stunning underwater world as you snorkel or scuba dive. If you want to escape the tourist trap, head to our Puerto Rico beach of choice, Ocean Park Beach. It is located in the suburban areas of San Juan, the capital city, set on the Atlantic Ocean on the north coast. The beach stretches from Parque del Indio in Condado to Barbosa Park. 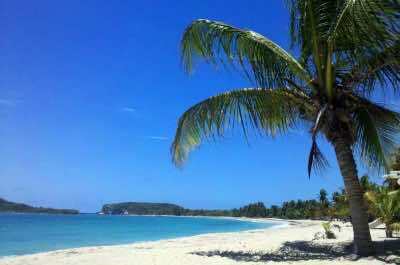 This beach offers a stunning unspoiled mile of lovely soft, golden sand and shady palm trees. There are fewer organized water sports, making it perfect for a relaxing walk or suntan. This is a beach that can get rough with large waves! If you are an experience surfer or paddle-boarder you will love this. Swimming is possible but probably not advised for children. Settle down with a book and soak up the sun, occasionally a vendor will come by with a small cart selling eats and drinks. Set along the inland side of the beach are small shops that you can explore on your way back to the car park. Put on your designer sunglasses and swim wear and set off to the trendiest Puerto Rico beach, Condado Beach! This is where the beautiful people mix and mingle and get seen. Located in San Juan on the northern coast, it is surrounded by high rise condos, hotels and luxury resorts. The Atlantic Ocean can get rough so be prepared for some large waves if you intend venturing into the water. It is great for surfers and body-boarders and showing off those golden tanned muscles. This beach has a Miami vibe, rent a lounger and an umbrella and sip a pink Pina Colada. Eats and drinks are available from the waiters who come along with small carts. Water sporting activities are easy to find and well organised. Snorkel, scuba dive or rent a jet ski. When you have had enough sun, head to the famous Ben & Jerry's where you must sample their signature waffle cone filled with an exotic flavoured home-made ice cream. Looking for a Blue Flag Puerto Rico beach? 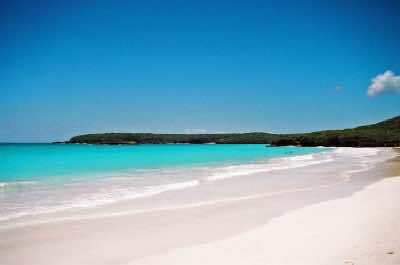 Set off for Playa Escambron, located near to Old San Juan on the northern coast of the Island. The beach is well maintained and offers showers, restrooms, facilities for the disabled, restaurants, kiosks and lifeguards. All you expect from a top class facility! The natural setting is idyllic with soft golden sands and huge palm trees offering shade. A rocky coral reef encloses the beach, protecting it from the large Atlantic breakers and creating a calm and warm swimming area. This beach is rated in the top five and is popular with both locals and tourists. Relax on a blanket on the sand under a tree and admire the beautiful scenery. If you love water sports, snorkeling and scuba diving will offer a fabulous array of marine life to explore. For a romantic evening, stroll along the trail in the surrounding Tercer Milenio Park. Calling snorkelers looking for an amazing Puerto Rico beach that is hidden away and takes a bit of effort to reach! Playa De Tamarindo is located on the small island of Culebra, which is about 20 miles east of the mainland of Puerto Rico. 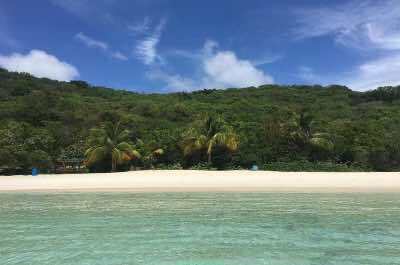 Take a boat or catamaran to get to Isla de Culebra for a fabulous day outing. Tamarindo beach is covered in rocks so wear suitable shoes. It is not the best place to lie down and suntan, but picking up shells and beach combing is great fun. The pebbles, which are worn smooth by the waves offer stunning colors of dark green, black and snowy white. Snorkeling is fabulous and you can swim and dive with the sea turtles in their natural environment. Then head for the reef, filled with a diverse range of colorful marine creatures. Kayaks are available to rent for those who want to enjoy this water sport. 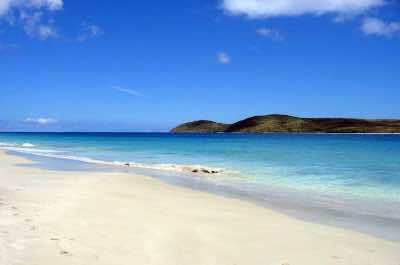 Zoni Beach is a paradisical setting on the far east shore of Isla de Culebra. It can be reached by Jeep or golf cart buggy, so rent yours and get going! If you want to escape the tourist scene on the busy and noisy Puerto Rico beaches like Flamenco Beach, head off here. Zoni is a long wide beach of perfectly white sand, dazzling blue waters and lush green tropical growth on the inland side. From the beach you have stunning views of the archipelago of Culebra and the islands of Tortola and St. Thomas in the distance. Take a walk and then settle down with a book under a large shady palm tree. This is the perfect setting to rejuvenate your mind and body. The beach has small waves, great for beginner surfers or paddle boarders. Pack your own eats and drinks as there are no facilities close by. The beach is a protected area for sea turtles who nest here, so after sunset and before sunrise it is closed to the public. The next island to explore for fantastic Puerto Rico beaches is Vieques Island. It is located off the eastern shore of the main island and can be reached by a fun 20 minute puddle jumper flight from San Juan airport or a taxi and ferry combination from San Juan via the ferry port at Fajardo. This well maintained beach is a Balneario, a public beach managed by a government agency. Balnearios offer services such as bathroom facilities, food stall, camping areas, security and lifeguards and the quality of the water is also monitored, making them perfect for a family day out. 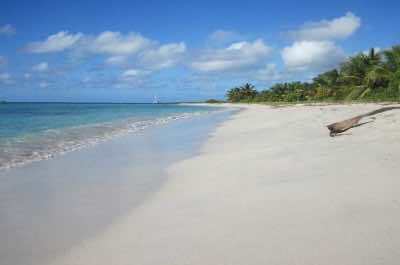 Sun Bay Beach is located on the central southern shore of Vieques Island on the Caribbean Sea. Sun Bay is pretty as a postcard picture with stunning views of the offshore cays, Monte Pirata in the distance and sail boats bobbing in the calm waters. The beach is lined with small palm trees, offering shade and a quiet spot to set up your hammock or beach lounger for some me-time. 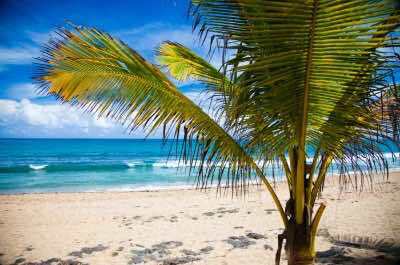 A Puerto Rico beach that has claimed a coveted Traveler's Choice 2013 award in the category Top 25 Beaches of the Caribbean is worth a visit! Located on the southern coast of the Island of Vieques Island, on the Caribbean Sea, is La Chiva, a picture-perfect setting that will take your breath away. 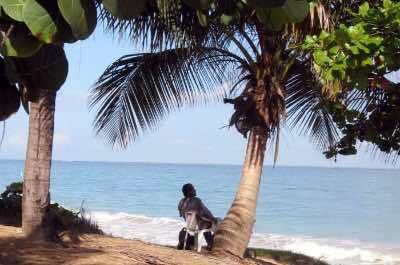 Vieques Island is a short trip east of the mainland and can be reached by air or ferry. The waters of this beach are so clear that you can see down to the sandy bottom. Beautiful tones of blue dazzle in the sunlight. Snorkelers will have a dream time admiring the underwater marine life. The waters are calm with no waves, making swimming safe for the whole family. Sit on the beach and relax and admire the amazing scenery, then take a stroll to the rocky cay on the far side and hunt for some shells to take home as a memento. Fancy spending time on a Puerto Rico beach that was used as a film setting for the iconic brand of VictoriaÕs Secret Swim Wear? Head off to Vieques Island, east of the mainland and you will find Playa Caracas! This ever popular beach was originally known as Red Beach by the Navy and offers a family friendly environment that is pretty as a picture. 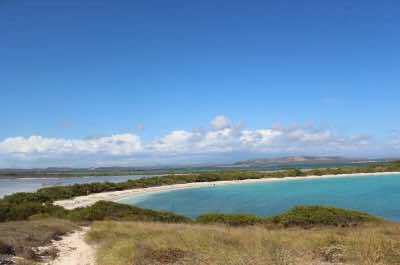 It is part of the National Wildlife Refuge on the south side of Vieques along the Caribbean Sea. Set amongst dramatic rocky cliffs rising up on either side, it has crystal clear turquoise water and soft white sand. The waters offer gentle waves making it fun for kids to try some boogie boarding. The beach is very wide and although it gets busy, you will always feel as if you have a lot of space to yourself. There are gazebos set up for picnics and bathroom facilities at the Refuge. Just when you think there are no more stunning Puerto Rico beaches to explore, you will discover Crashboat Beach on the far north western tip of the Island. This beach gets it name from the site of the military port close by that was used to rescue downed aircrews. A perfect setting for a day out, the beach offers soft white sand and clear turquoise waters. The calm surf makes it an ideal spot for families with small children. For those who want something extra, there are high rocky cliffs, perfect for jumping off into the sea below. Facing west, this beach is known for its stunning sunsets. Settle down for an evening that you will never forget. As the blazing red sun sinks down onto the horizon, local vendors come out and set up fires to prepare delicious traditional food. Mix and mingle with tourists and locals who will give you a real taste of Puerto Rican life. If finding a remote Puerto Rico beach that will take your breath away is on your list of things to do, head for the south west tip of the Island to Playa Sucia, La Playuela at Cabo Rojo. Come prepared with food and drinks, sunscreen, water, chairs and umbrellas as this is not a tourist hot spot and facilities are limited. There is a lovely light house up on the cliff at Cabo Rojo and it is worth visiting the observation deck to get a magnificent bird's eye view of the beach and the ocean before settling down on the soft white sands. The water can get a bit rough so be prepared. There are beautiful walking trails around the beach for taking a stroll and seeing more great views. Locals love this beach, knowing that it is off-the-beaten track and quiet. Arrive early because access is limited, keeping this a little secret hidden gem.